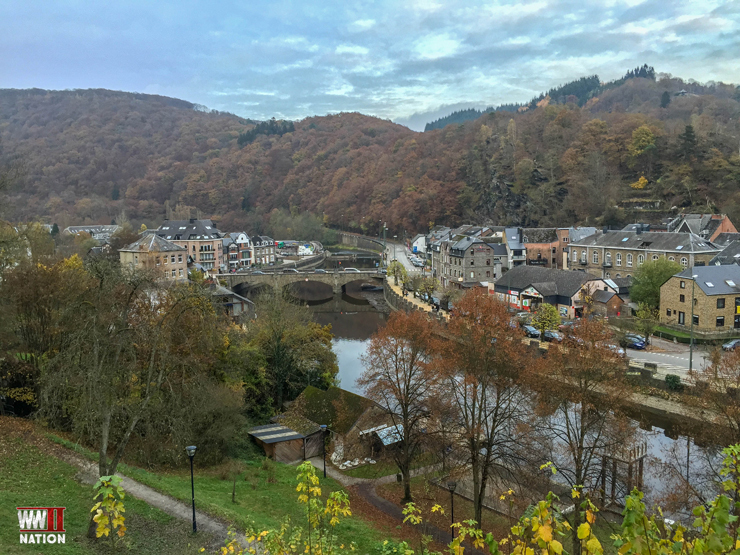 During November, Ross and I ventured to Belgium and in particular to the Ardennes region to explore this area’s connection with the Battle of the Bulge – Hitler’s last throw of the dice in the West in December 1944. 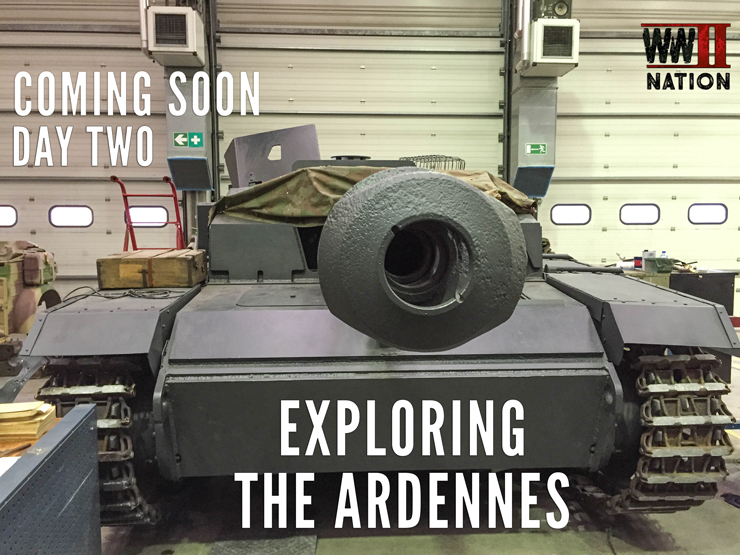 In the first of a 5 part journal post ahead of the release of the Vlogs from our trip, I will be looking at our photo highlights reel as well as some of the history connected with the sites we visited in the Ardennes. 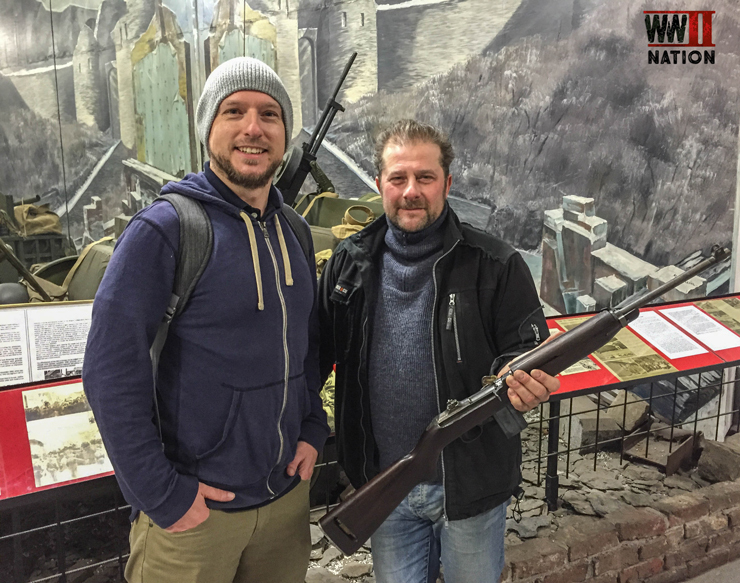 After an early start and full morning of travelling we eventually reached the town of La Roche-en-Ardenne late in the afternoon where we had agreed to meet up with our guide for the week, Michel Baert at the Musee de la Bataille des Ardennes. 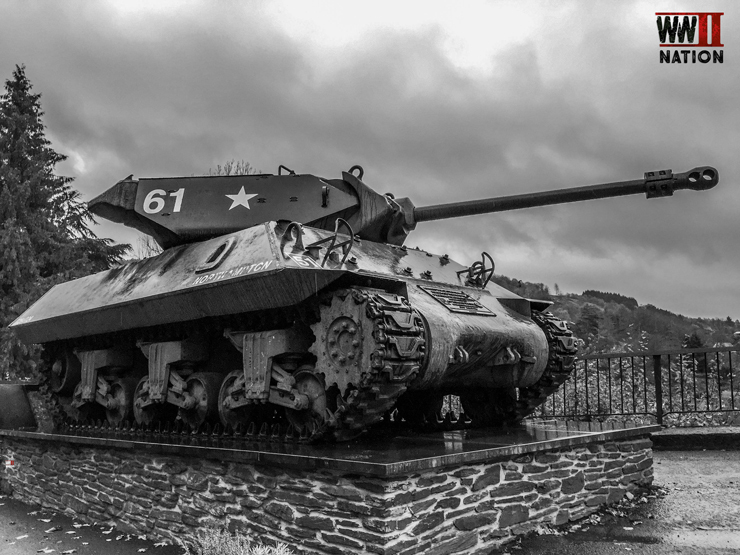 Even before we got into the town we came across our first piece of armour that stands as a reminder of this area’s remarkable past and connection with the Battle of the Bulge. Standing atop the hill, an M10 British Tank Destroyer stands guard overlooking La Roche. This M10 British Tank Destroyer was placed here on the anniversary of the town’s liberation in January 2000 by surviving veterans of the 1st Northamptonshire Yeomanry – one of the regiments who helped liberate the town. It is said to depict the tank of Lt Tony Faulkner, the first officer from this regiment into the town. 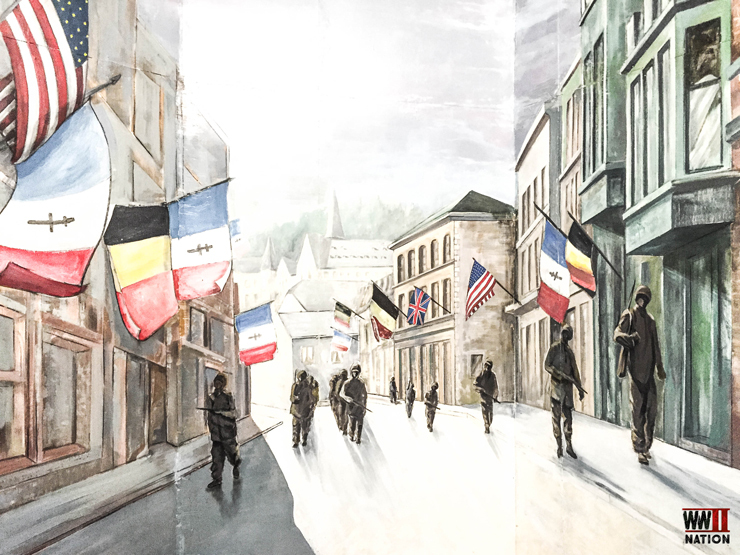 On the 11th January 1945 as the Allied counter thrust was pushing the Germans back out of the Ardennes, men of the British 51st Highland Division, the 1st Battalion, Black Watch, linked up at La Roche with elements of the US 84th (Rail-Splitters) Infantry Division & 4th Cavalry Group who were advancing on the other side of the river Ourthe and liberated the town. Interestingly the town was retaken without a fight as the Germans had withdrawn just before the Allied troops arrived. Even despite U.S. Armour taking up a parking space, there is more than enough ample parking for those wishing to visit the town and museum. 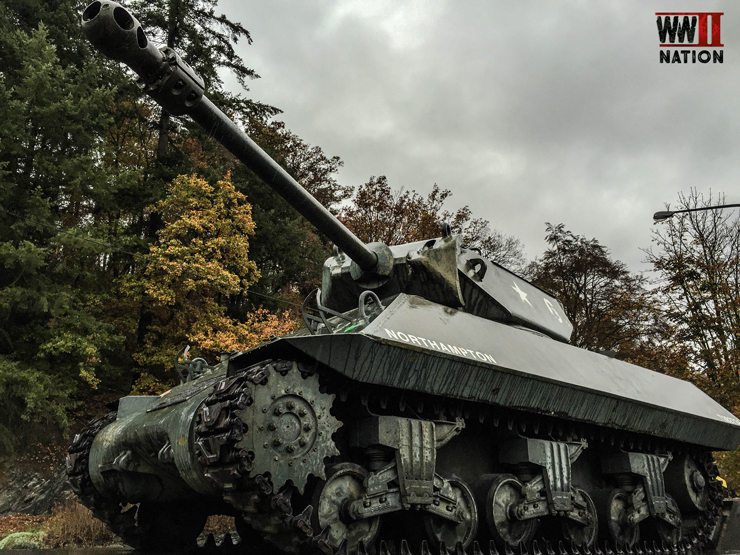 This M4A1 Sherman Tank, armed with its 76mm gun is another reminder of the town’s strong connection with the Ardennes offensive. 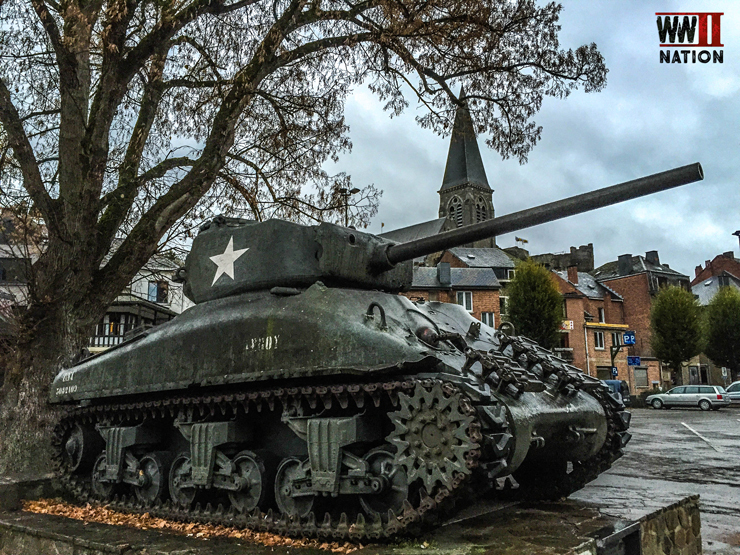 Inaugurated in December 2004 it pays tribute to the men of the 2nd and 3rd US Armoured Divisions which helped liberate this area of Belgium in January 1945. One thing which was immediately apparent and very hard to miss was the battle-damage on the frontal armour right between and besides the gunner and driver position. It was also interesting to see an example of tracks being attached, for I would guess extra armour protection for the crew. The Museum in La Roche is a family run affair. Monsieur Gilles Bouillon’s father originally started the collection not longer after the Second World War finished. And the museum today is located in a former petrol station and has a fascinating display spread over 3 levels. 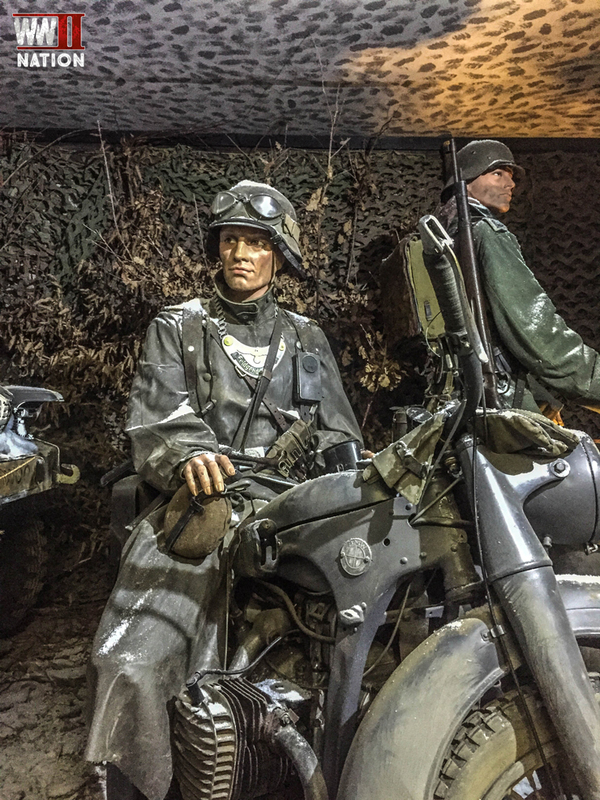 It is a very interesting place to visit to look not only at the US and German role in the Battle of the Bulge but also the British involvement and that of the French and Belgium special forces during the campaign. Just one of the many British related displays from the Battle of the Bulge, a 1942 Daimler Dingho Mark II light reconnaissance / scout car. 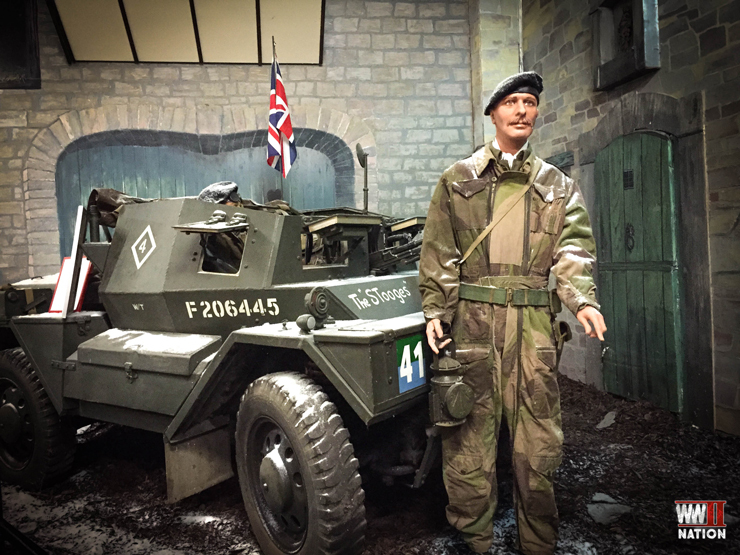 Typically armed with just a Bren Gun and up to 30mm of armour to protect its 2 man crew, it was its speed and 4×4 capabilities that were its main defence. 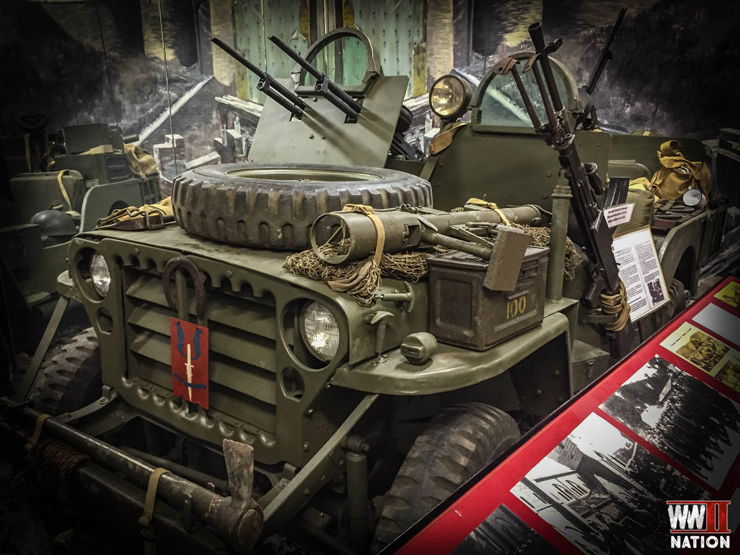 An interesting example of a modified jeep for the Belgium SAS who were involved in the Battle of the Bulge. The jeeps were stripped of all non-essential parts and carried a wide array of specialist gear and modifications. This one could carry 3 men, had armour plating with bullet proof glass on the front to shield both the driver and frontal gunner and was equipped with radios, a water condensing unit and other vital essentials such as extra fuel, food and ammunition to allow these men to carry out long range reconnaissance behind enemy lines even including in the Ardennes as we shall see later in our trip. Upstairs on the second floor there is a remarkable display of personal items and equipment kindly donated by returning veterans. One thing that struck Ross was the level of small detail that Gille and the team had gone to with their displays. 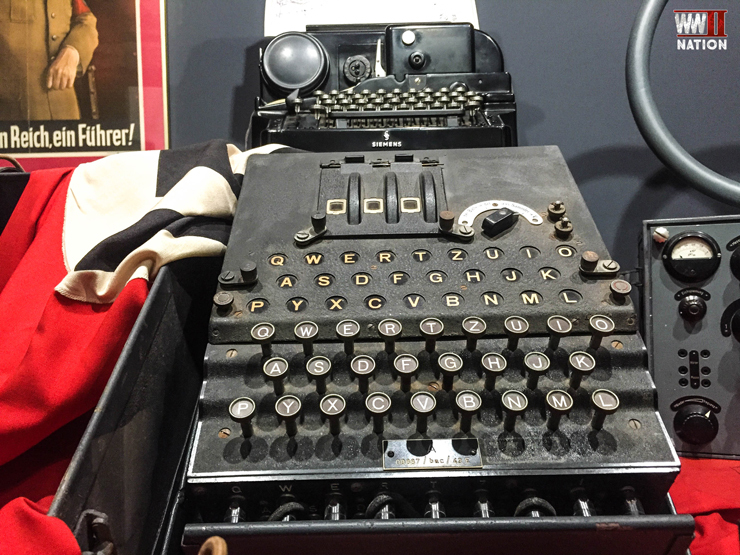 This also caught our eye whilst look around, it is not everyday that you stumble upon an original German Enigma Cypher machine. 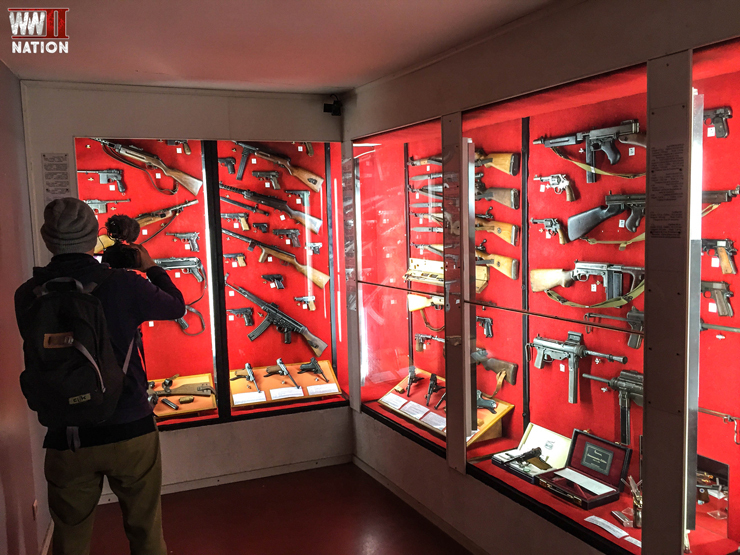 There is also on display here at the museum, an incredible collection of WW2 weapons from all the different combatant nations that were involved in the Battle of the Bulge. 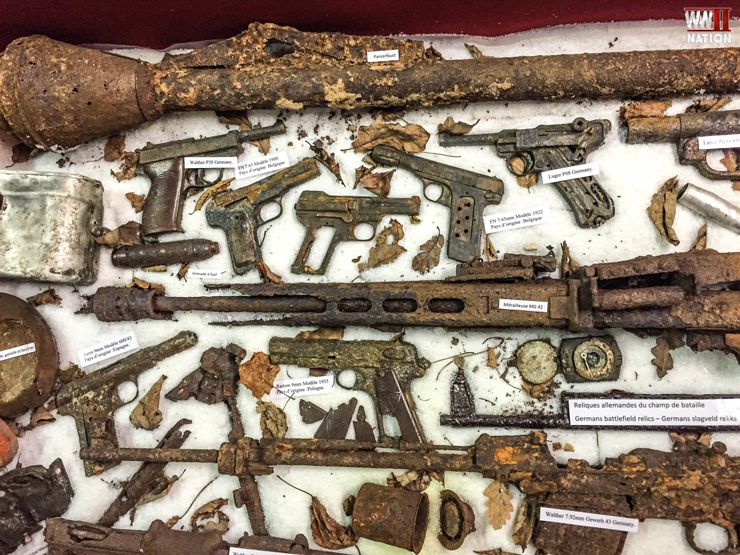 Among all these guns is also an intriguing collection of German – I would guess both Wehrmacht & SS – combat and ceremonial knives from this period. Monsieur Gilles Bouillon as part of his guided tour of the museum, kindly agreed to open up a few of the exhibit display cabinets so we could get a closer look; including this one which contained a whole host of original artifacts left behind from the Battle of the Bulge on the former battlefield. 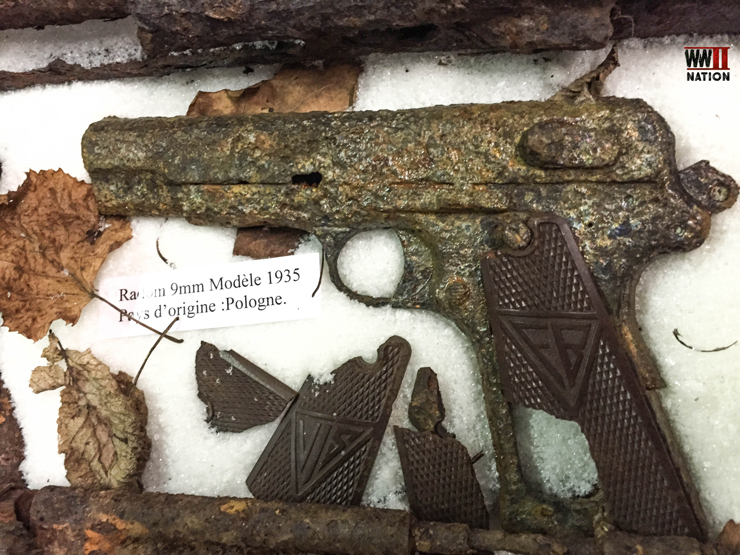 One particular item that Gilles was keen to tell us about, that stuck out from the rest, was this Polish 9mm 1935 Modele pistol. Apparently these were issued and carried by all Polish officers as their standard side-arm. 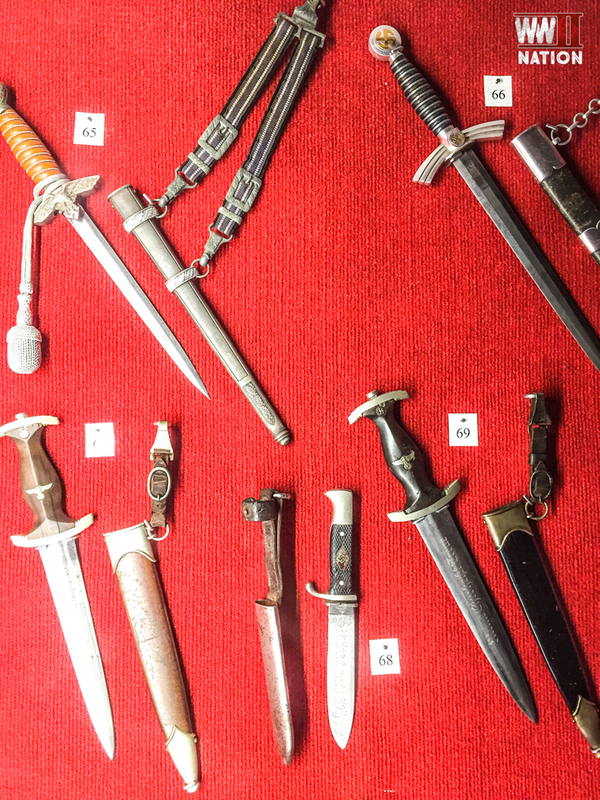 Following the invasion of Poland by Russia and Germany and the preceding Katyn Massacre, apparently these weapons had been taken off the Polish Officers and given to the Germans as a gesture of their alliance and saw active service again, being employed by German troops fighting in the Ardennes. Now Ross and I do not know if this is 100% accurate and need to verify this story, so if you have any further information about this, we would both be very keen to hear from you about it. It would not be WW2 Nation if we did not get to handle a few WW2 related items or weapons. And we were certainly not left empty handed during our trip to the museum at La Roche. 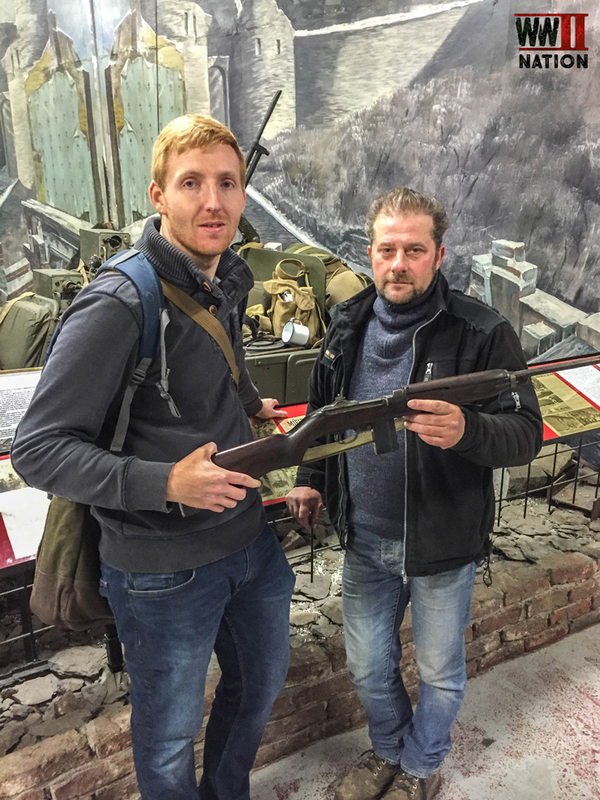 Monsieur Gilles Bouillon has a full collection of M1 Carbines and was only too happy to discuss this weapon with us. He told us that this weapon was primarily used by secondary line troops, rear echelon or front-line troops on special duties, i.e. radio operators for example. And I can completely understand why, I was shocked by just how light it was and how this weight compared to the Garand and Thompson. 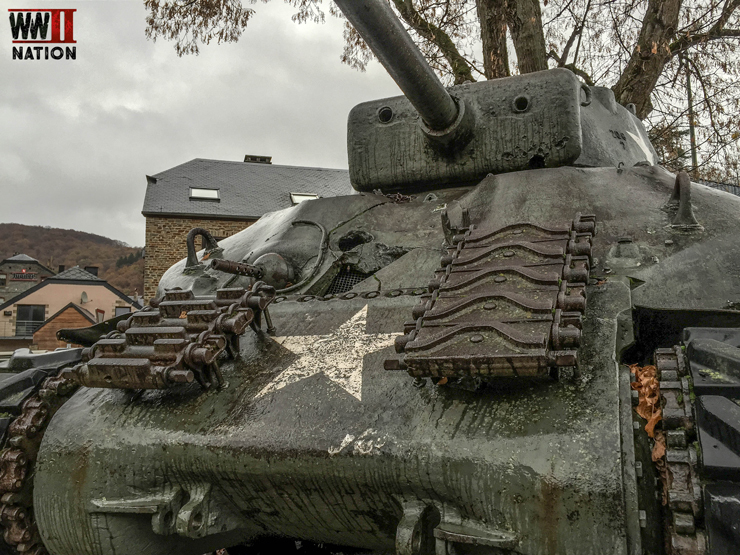 One of the things we learned from our trip around the museum about the town of La Roche was its experience during the Battle of the Bulge and the fact that it had been virtually destroyed by the incessant shelling and Allied air-raids on the town. Around 140 tons of bombs were dropped on the town by successive waves of Boston bombers. The result of all this was that 114 civilians were killed here, and out of the 639 houses in La Roche at this time, 348 were completely destroyed or very badly damaged, including the church, castle and bridge which was successfully blown. Apparently the Germans had placed a number of Flak Guns on the hill overlooking the town at this time. A massive thank you to Michel and Gille for kindly taking the time to show us around their Museum. I would highly recommend visiting it, as well as La Roche in general, for all those wishing to learn more about the British involvement in the Battle of the Bulge. 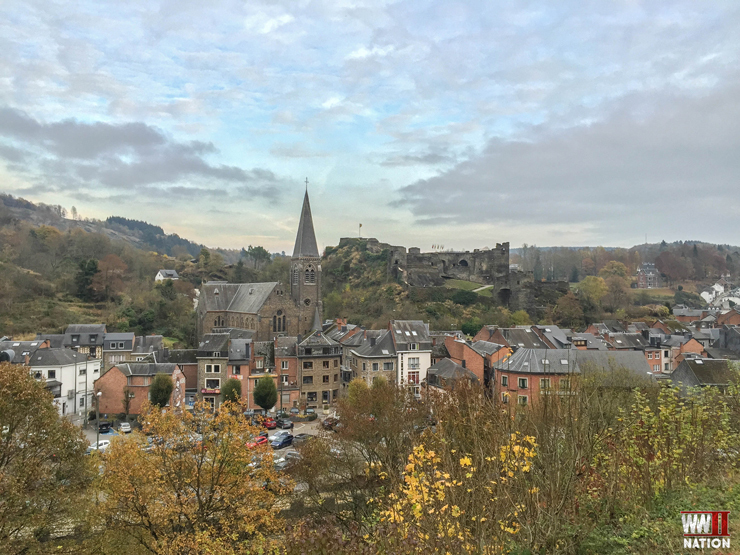 I hope you enjoyed our highlights from Day One of our trip Exploring the Ardennes. The First Vlog will be out on Friday 16th December. The Photo Journal of Day Two which sees us following in the footsteps of the 101st Airborne Division around Bastogne and Foy will be out next week. 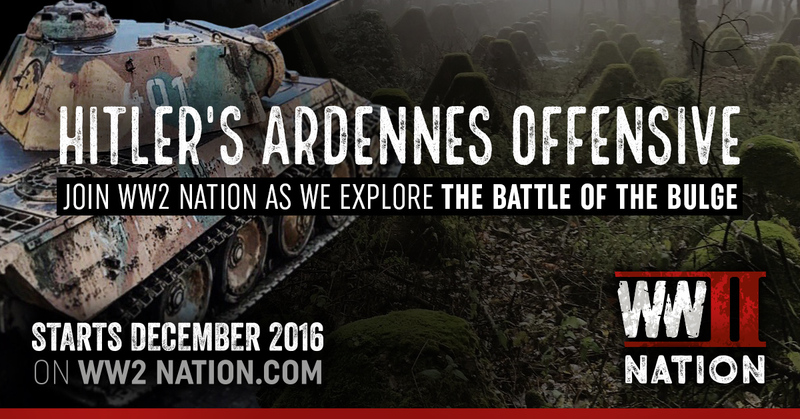 If you wish to visit or find out more about the Musee de la Bataille des Ardennes in La Roche, Click Here.